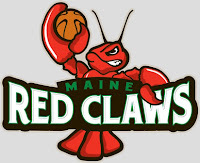 Trailing by as much as 27 points, the Maine Red Claws (2-4) made a late charge on the Fort Wayne Mad Ants (3-2) tonight, but it was too little, too late as they fell 105-99. The key stat of the night was the Red Claws’ 23 turnovers, including 19 in the first half. Maine pulled within 6 points late in the game, but it was as close as they could come as the visiting Ants took home the win. Six Ants finished in double figures with Roderick Wilmont leading all scorers with 20 points. Teammate Chris Kramer proved to be the emotional leader for the Ants on the night, making things happen and adding 15 points to the tally, while Walker Russell put down 18 and added 12 assists. Chris Hunter matched Russell’s 18 to round out the top scorers. Five Red Claws scored in double figures, led by Mario West’s 19 points and 12 rebounds. West also led the team in turnovers, however, with 8. Rookie Champ Oguchi had a career-high 19 points for his best performance to date. Tiny Gallon continued his strong play with 17 points to match his career-high, adding 11 rebounds. Maine will return to action Sunday when they host the Springfield Armor at 5 PM. The Mad Ants next game is also against the Armor as they travel to Massachusetts tonight to take on Springfield tomorrow night at 7 PM.